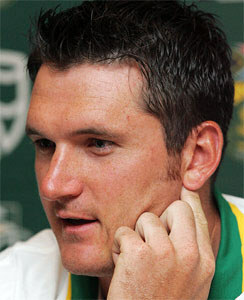 Sydney, Jan. 1 : South African captain Graeme Smith will miss this month''s one-day series against Australia because of an ongoing elbow injury, coach Mickey Arthur has said. The Courier Mail quoted Arthur as saying that Smith had batted in enormous pain in the first two Tests of the three-match series against Australia, getting through on cortisone injections and scoring 48, 108, 62 and 75 to lead his side to an unbeatable 2-0 series lead. Smith''s early departure from the Australian tour gives the left-hander the chance to have blood taken from his arm and injected into his elbow to allow growth hormones to help heal the injury, Arthur said. He said the operation hadn''t been performed in South Africa before and may need to be done in Australia first, with a second injection back home in South Africa. Arthur rated Smith a "90 per cent" chance to play in Saturday''s third Test against Australia. "I know there has been a lot of speculation as to the state of Graeme''s elbow," Arthur said at the SCG today. "We are sending him home after Sydney. "We want him to get right for the home series and we think by sending him home straight away and getting these injections, it will give him the best opportunity of being ready for the Test series in South Africa (against Australia starting on February 26 in Johannesburg)." Spinner Johan Botha will captain the one-day side and out-of-form Test opener Neil McKenzie will remain with the one-day side as a standby batsman. "It''s unfortunate to lose your captain but we need to give him the best opportunity of being ready for the Test series in South Africa," Arthur said.